DIRECTIONS: Leave POS heading east via the CR H’WY, passing Nestle, FEDEX , Pricemart , Santa Rosa and all the way to Valencia . On reaching the Valencia Junction, passing the Police post on the right, the road splits into 2. Stay left and proceed to the Toco main RD. When you get to the Toco main RD turn left . Drive for another 40 minutes passing Matura, Balandra beach and then to Arthur’s Bar on the left. Parking is just before the bar along the side streets. Food will be on sale: crab and dumpling, fish and chicken with provisions , fish broth, souse etc etc. The drive is about 1 hr 45 minutes . Please leave home early to avoid the traffic! Hash starts at 3 30 PM and these hares have no intentions of waiting for the late comers !! TIME: 3:15PM Briefing !! – 3:30PM START !! Proceed East along the extent of the Churchill Roosevelt Highway, exit North (left) at Antigua Road, Wallerfield (last exit to Eastern Main Road). 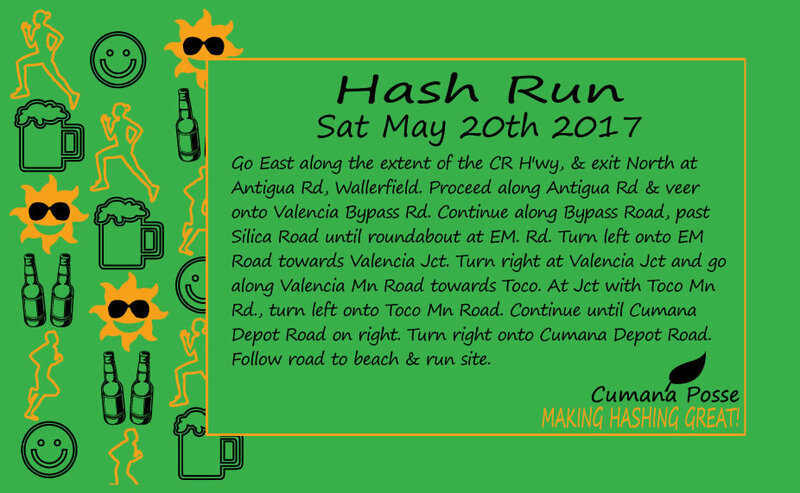 Proceed North along Antigua Road & veer onto Valencia Bypass Road. Continue along Bypass Road, until roundabout at Eastern Mn Road. Turn North (left) onto Eastern Main Road towards Valencia Junction. Turn East at Valencia Junction and proceed along Valencia Mn Road towards Toco. Turn right (beach side) onto Cumana Depot Road (Cumana Catholic Church on corner). Run site is on beachfront. Park as directed. Note: Expected road works/congestion on the C.R.H….leave early!! !, get to run site early & relax.. Please do not proceed on run after the pack has left. Do so at own risk! 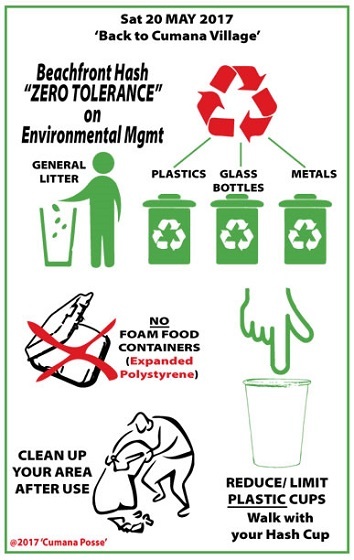 Polystyrene Containers: Not allowed at this event!! Drive east along the Churchill Roosevelt Highway, passing the Piarco Intersection. Continue for 10 min passing Pricesmart and O’Meara road to the next traffic lights, Tumpuna Road. Turn right onto Tumpuna Road and head south. Continue south for a further 6 min (passing the horse farm on the left) toward San Raphael Junction. You will observe a church on the left. Turn right at the junction and head west driving for approximately 200 meters (pass a bridge) to a y junction and turn left. Drive south for approximately twenty minutes through Brazil Village to Talparo Junction. This is the Hash Site. Look out for HHH signs along the way. Food on sale! Fried rice, BB-Que Chicken or Fish, Fresh salad, Potato or Fig salad.